For new employees commencing mid-year, set up your employee's details in the normal manner by selecting Employees > New Employee. For further assistance with setting up your employee, please see the relevant help topic within the Support section. For a new employee starting mid–year, a start date is essential in order to ensure that the employee is added to the payroll in the correct pay period. It is also an RTI requirement that the employee’s starter details are included in your Full Payment Submission (FPS) to HMRC the first time you pay them. 1) Within the employee's record, click the tab Starter/ Leaver. 2) Enter the employee's Start Date in the field provided or select the start date using the calendar. 3) Oversea Employer - if the employee continues to be employed by an overseas employer (who has been sent to work for you), tick the box provided. 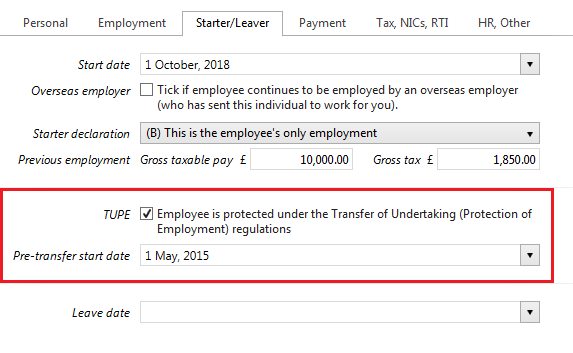 Under Seconded to work in UK, select the option that applies to the employee and tick the associated statements, if applicable. If you have reviewed the employee’s passport as part of checking that they have the right to work in the UK, the employee’s passport number should be entered in the employee’s ‘HR’ section for inclusion in your Full Payment Submission to HMRC. 4) After the employee’s start date has been entered a ‘Starter Declaration’ menu will appear. Select the statement that is applicable to the employee from the drop down listing. 5) If the starter declaration that your employee makes is statement B or C, then enter the employee’s taxable pay and tax paid from their previous employment in the fields provided. 6) Click Save to save your employee's starter details. Your new employee will now be added to the payroll in the pay period which corresponds to their start date. Please note, since 6th April 2013 with the introduction of RTI, employers are no longer required to submit a P45 or P46 to HMRC informing them of a new employee. Instead, HMRC will be notified of the new employee in the Full Payment Submission you submit to them the first time you pay the employee.